Many songwriters, composers and musicians rely on staff paper to quickly jot down musical ideas or create multi-instrument compositions. The standard system of Western music notation is recognized around the world by musicians in a variety of musical genres. Although correctly notating music on staff paper requires a thorough knowledge of both the instrument or voice you are writing for as well as the appropriate musical terminology, a few basic techniques and ideas can begin the writing process. Write the rhythmic meter and key signature of the music you will be composing to the right of the note clef. These visual symbols display important information concerning the number of beats that will be allocated to an individual measure as well as the specific pitches that will be raised or lowered a semitone consistently throughout the piece. Many popular songs are commonly written in "common time," indicating that there are four beats in a measure and a quarter note receives one metric pulse. 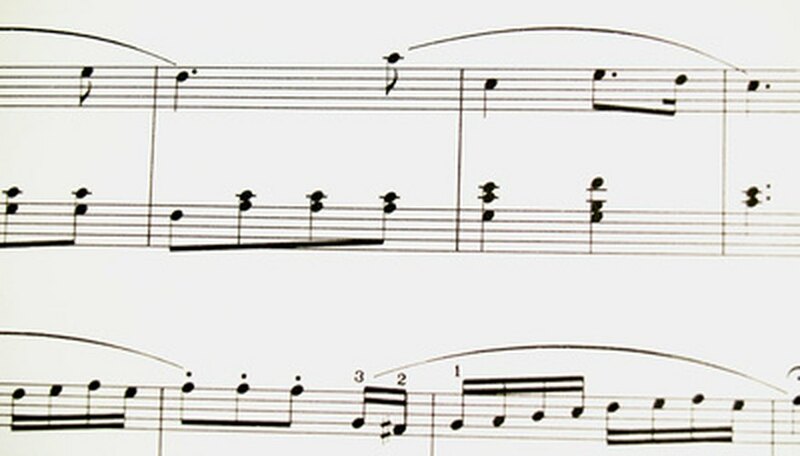 Although key signatures are not essential to the written notation comprising a musical work, establishing a framework of semitone adjustment removes the need for drawing "#" and "b" symbols next to each raised or lowered note. Use the line and spaces on the music staff to properly orient the pitches you are transcribing to the sheet music. When using the treble clef, the space between the third and fourth lines counting down from the top of the staff is the note A4 located above middle C on the keyboard. When using the bass clef, the space between these same lines in the note C3, located exactly one octave below middle C.
Add the correct number of beams or flags to your note heads to indicate the rhythmic value of the note. Typically, individual notes that do not have any flags attached to their stems are known as quarter notes, while notes with one flag are called eighth notes. Notes with two flags are exactly half the duration of the eighth note and are thus called sixteenth notes. Depending on the time signature you have created, each of these note values might receive a different portion of the metric pulse of the music. Write the lyrics for vocal parts you have create underneath the notes and rhythms corresponding to the syllables of the words. Place the lyrics between the staffs in order to facilitate rehearsal and practice by singers and directors. Dynamic markings and expressive lingo can add depth and interest to your music. Research the terms affiliated with these elements of music notation to add another level of specificity and clarity to your compositions. A standard musical dictionary includes a wide range of words that can be added to a composition to imply volume levels and tempo changes. Ensure that the notes you are writing are within the available range of played or sung notes for the instrument or voice for which you are composing. Many beginning composers make the mistake of writing notes that cannot physically be performed on the instrument for which they are writing.